Today I chose to use a game app in storytime. Yes, I used my iPad…during Screen Free Week. I didn’t do it by accident or in spite of the event. Awhile back before I remembered about the week, I came across another librarian’s storytime plan that was perfect in its own right, but it had the added bonus of a recommended app well-suited to my preschool storytime audience and setting. I put the theme on the schedule for this week and kept on planning. I could have reconfigured the schedule when I realized the significance of the week, but I made a conscious choice to go ahead with it because I think how, and not just how much, we use apps with kids needs attention. How better to model that usage than by including one in storytime? How did it go? The kids and I talked, read stories, told stories, sang songs, played with the feltboard, built digital robots with the app, then built paper robots, cleaned up, and then played with LEGOs. We had a blast and those amazing kids demonstrated their wide array of early literacy skills and their ability to smoothly migrate from one medium to the next without obvious hesitation. First off I have to thank Anne Hicks of Anne’s Library Life. Not only did she post her great robot storytime plan for the rest of us to see, but she answered my questions about her experience using an iPad only vs. using an iPad mirrored on a big screen in her library. My children’s library is lovely, but not particularly suited for using a big screen to mirror what’s on my iPad. Behind the story area is a corner of book shelves leaving no wall space for a safe place to place a monitor without it being precariously set on a cart with cords extending across the floor, just waiting for feet to trip over. The room is also full of windows and we really don’t like to darken them. With such dark winters, we’ll take all of the light we can get in Alaska. The other reason I wanted to use my iPad only in the storytime, is the fact that this was not advertised as a digital storytime. We do have another meeting room with a large monitor that I’ve used to share an enhanced e-book as part of a special program, but my ultimate plan in storytime is to reflect the intertwined reality that exists in our mixed media lives. Since this was the first time I used interactive digital media in a weekly storytime (instead of a regular e-book), I also didn’t want the screen to be the focus. I felt that using the iPad only (without the monitor) was a more subtle and normalized way to show families how digital technology can be successfully integrated into the activities we all love already. The iPad is one more tool that extends our exploration and fun. Each week, I display books that I am going to include in storytime, as well as a few others, in front of the group. (I often bring out more books than I am going to read during storytime so kids can see related books to read in the library or take home with them.) I have kids use the images and words or letters on the book covers to try and figure out what we are going to talk about. With books like Robots by Mark Bergin (Franklin Watts 2001) it was pretty easy this week. While this book is older, it showed some basic images that were helpful. We used these images to talk about what differentiates a robot from a person. And then we decided to pretend to be robots! With legs, arms, bodies, and heads, we fit the bill. Once everyone was settled, I installed on/off buttons on every little robot. We practiced our robot movements, our robots sounds, and even learned the robot word for yes, “Affirmative,” which features prominently in the next book, Boy + Bot. Before each book we turned on our listening buttons. We didn’t make them quiet buttons because questions and comments are strongly encouraged in my “interactive” storytimes. 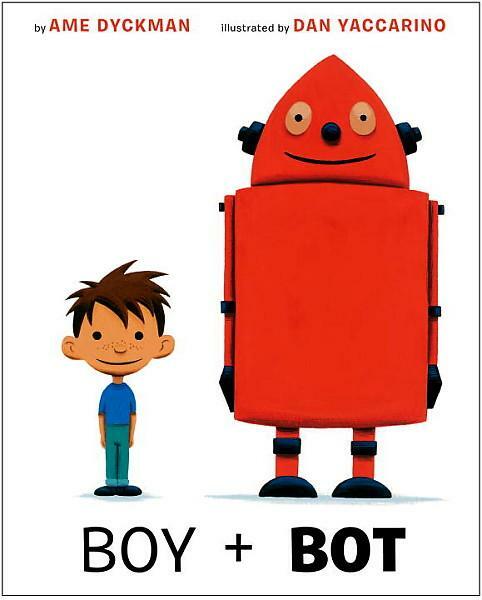 Boy + Bot by Ame Dickman with illustrations by Dan Yaccarino (Alfred A. Knopf, 2012) was the perfect book for this storytime. The simple text and friendship theme is easily understood and loved by the preschool crowd. The boy and robot meet, become quick friends, and then appreciate how each works after a slight mishap with the robots power button and the boy’s nighttime sleep, both new concepts to the other. Shiny and tall with antennae on the top (hands/arms above head and then hold fingers up as antennae above head). Along came a girl with a penny one day (walk fingers and then show a penny to the kids). Bought a noisy robot (make sound effects!) and took it away. When all of the robots were purchased, I asked the kids how many were left. Some proclaimed “zero” while others said “none.” We talked about how zero was the number that represented none and then we made the shape of a circle with the fingers of both hands touching and talked about how the number zero, the letter O, and the circle were all the same shape. We then had to make big circles with our arms overhead, the fingers on one hand, and our bodies, of course. Robot Zombie Frankenstein by Annette Simon (Candlewick Press, 2012) was the final book I shared. This is a great book to share at storytime, but I have found that reading it definitely needs some prefacing. The elements of friendship, playful competition, and repetition are subtle and preschoolers may need help appreciating them (dialogic reading is key here). I preface the story by telling kids it is a story about two friends who are having a contest. As the story progresses, kids love to guess what costumes the robots will come up with next. Some preschoolers were even able to remember the long list of personas the robots dressed up as throughout the competition. When I get all warmed up, watch me go. The object of the app is to take junkyard parts and make a robot that can fly. Legs, arms, bodies, and heads are chosen from three options for each piece displayed at the bottom of the screen and dragged to the flashing shape of the robot part to be added. Then the robot is flown by dragging the robot with your finger (directed by up, down, left, and right arrows) through a maze to an overhead magnet. Once the robot is connected to the magnet, it goes through the tester. It comes out the other side and receives the “approved” stamp. There is no sound and no in app advertising. We talked about shapes, colors, directions, body parts, and took turns picking which piece to add. We made two robots before moving on. I tested out both this app and Bot Garage based on the book Lots of Bots! : A Pop-up Counting Book, but I thought this one worked better for my storytime. 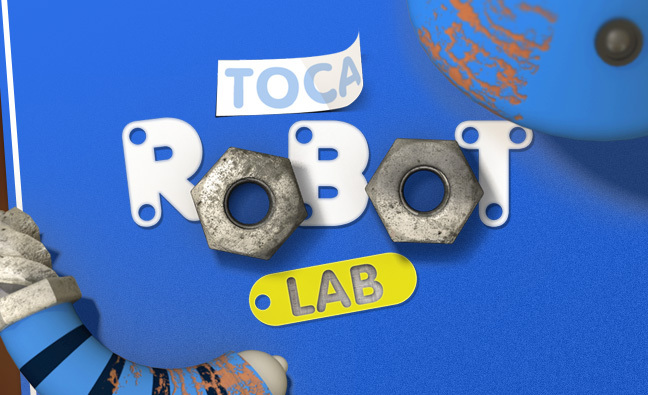 The Robot Lab’s simpler screen (image of cardboard box plus three body part choices at a time and the flashing outline of the body part to be added) allowed the kids to focus on one aspect of the new media at a time. We started by adding legs, and were then guided to add the parts one section at a time moving up the body of the robot. They weren’t trying to understand a busy background at the same time as making a choice for which color or shape of part to add. It was easy to see what the object of the game was, especially important when using the smaller screen of an iPad (vs. on a monitor) with a group. 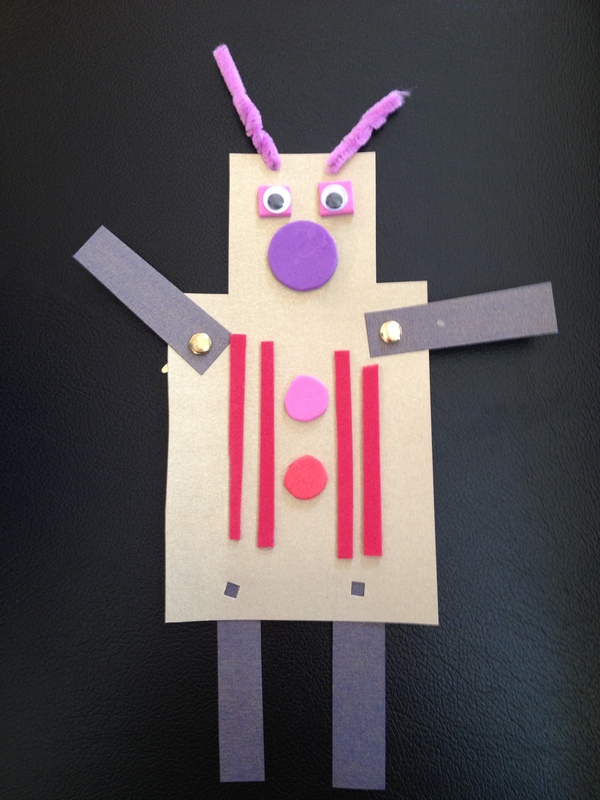 For this storytime’s craft we built paper robots. 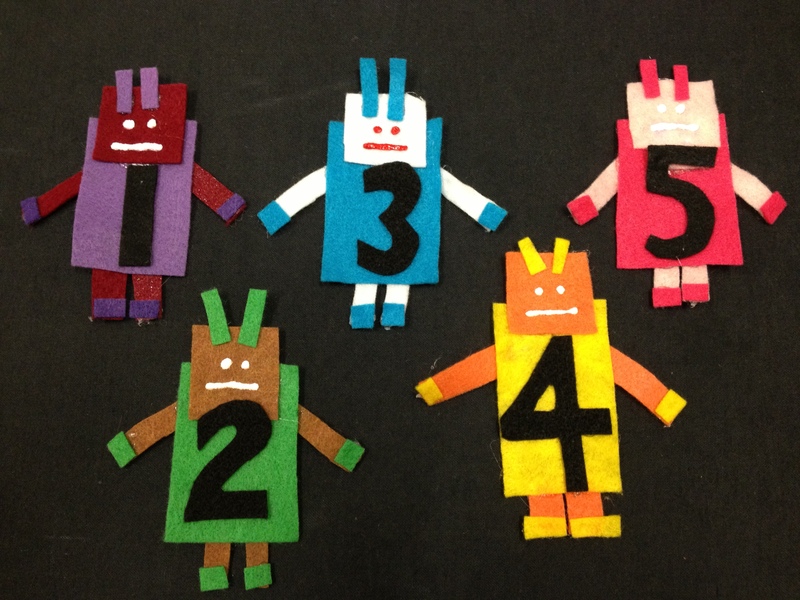 The kids were thrilled to create these little bots inspired by Rebecca at Sturdy for Common Things. I substituted a few pieces and steps because I couldn’t find glitter paper or enough brass fasteners in town for the whole group. Ah, small town living. The changes worked out just fine! metallic (or glittery) cardstock- I cut each 8 1/2 x 11″ piece of card stock into 3 sections and then cut each strip (approximately 8″h x 3 1/3″w) to make a one piece robot with a thinner head and wider body, leaving rectangles used for arms (shorter) and legs (longer) from the bottom for each robot. small hole punch- I let kids/parents punch the holes where arms would be attached with fasteners and on the head for the pipe cleaner antennas. For kids who still wanted to play together at the library, I offered up my basket of large LEGOs® at the end of storytime. A small group of parents and kids sat and talked together while building robots, trucks, trains, and walls. What would I do differently with this storytime? I would include more tips for parents about joint media engagement, early literacy, and using apps. I focus on the kids and modeling successful practices during storytime, but I am looking for more strategies for informing parents about the skills, practices, and research without taking away from the storytime experience. Have any tips? I would love to hear them. Update 6/18: Check out a 2018 Robot Storytime with more ideas! 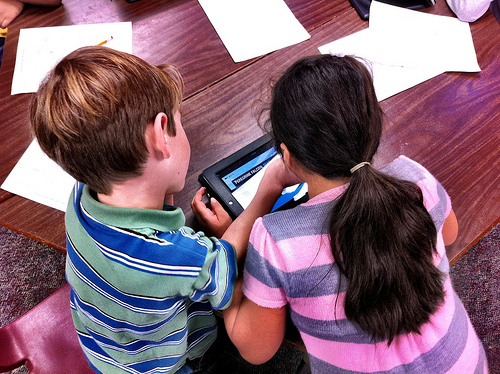 Photo of children with the iPad is courtesy of Barrett Web Coordinator, used according to a Creative Commons license.